The Dominican Republic is an unsung jewel among the Caribbean Isles. Occupying the eastern portion of the island of Hispaniola, this beautiful country boarders both the Atlantic Ocean and the Caribbean Sea. Its interior is lush with rivers and semitropical forests, but its palm-dotted coastline is a lure to many travel enthusiasts. With warm daytime temperatures even during the winter months, the Dominican Republic’s beaches are welcoming all year round. The Dominican Republic’s beaches offer something for everyone, from family-friendly resorts to adult only destinations. Discover the focus of your next international vacation with our list of the six best Dominican Republic beaches. Located on its northeast coast, this Dominican Republic beach has been listed among Condé Nast Traveler‘s top ten beaches in the Caribbean. The water here is a crystalline turquoise during the warmer months. Rugged rocky outcroppings and a slew of palm trees provide a stunning backdrop to the beach’s local shops and eateries. Winter travelers should keep in mind, however, that this beach’s Atlantic location may result in debris being washed ashore during the months of December through February. Winter travelers should keep in mind, however, that this beach’s Atlantic location may result in debris being washed ashore during the months of December through February. Windsurfing is a popular sport in this area, and extensive two-day classes are available. Most visitors to this area rely on their hotels for facilities such as restrooms and showers. Travelers should be aware that the waters of the Atlantic coast may become choppy and the tides may harbor debris during the winter months. While enjoying your stay at Playa Dorada, there are many attractions a short motoconcho – or, motorcycle taxi – ride away in nearby Puerto Plata. This is home to an international airport, the delicious Del Oro Chocolate Factory, as well as the Amber Museum, the inspiration for the blockbuster classic, Jurassic Park. Snack on fast food with a uniquely Dominican twist at Pizzata, where you can taste pizza flavored or lobster filled empanadas. For a more eloquent dining experience, try the Green Jack restaurant at the Blue Jacktar hotel. 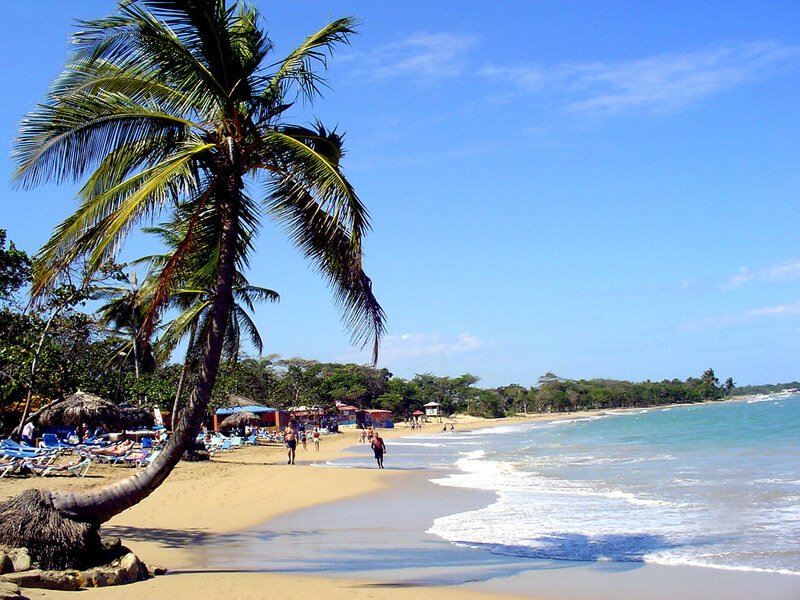 A mere 20 miles (30 kilometers) from the capital city of Santo Domingo, Boca Chica is one of the most popular of the Dominican Republic’s beaches. Surrounded by small coral reefs, this beach is a prime retreat for tourists and locals alike and offers safe swimming year round. Because of this, it may at times become crowded. If the crowds aren’t your thing, head back into the city for lunch at Barra Payan, the world famous sandwich shop known for serving the country’s president and his cabinet. Cool off with a visit to Meson de la Cava, a black tie restaurant nestled within a natural cave. 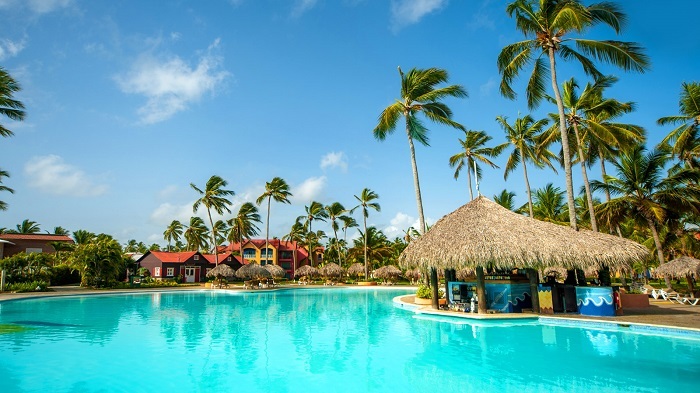 Punta Cana, along with its sister beach, Bávaro, form La Costa del Coco, or the Coconut Coast, at the point where the Caribbean Sea joins the Atlantic Ocean. 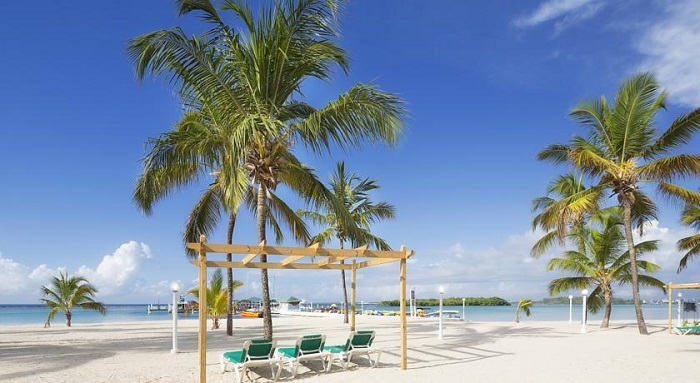 The area boasts the highest concentration of resort hotels in the Caribbean, strung like pearls along its 20 mile (30 kilometers) stretch of golden sand beaches. Conveniently located minutes from the Punta Cana International airport, travelers can enjoy windsurfing, kayaking, sailing, and other water sports, as well as zip lining. The thirsty can refresh themselves with a fresh coconut in the shell, opened with a machete by local beachside vendors. Those who wish to experience the thriving nightlife can grab an iconic El Presidente Dominican cerveza at a multitude of dining establishments. 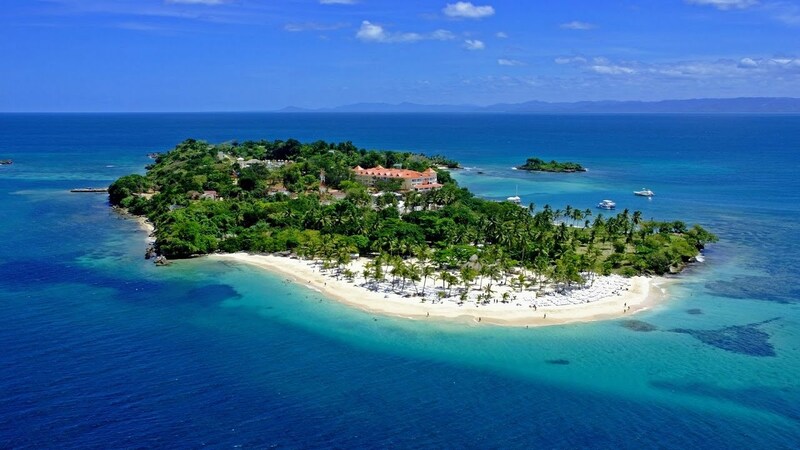 Playa Costambar is one of the most family friendly Dominican Republic beaches, designed for an all day stay. Lounge chairs and volleyball nets abound. When your family gets hungry, you can simply visit one of the many open-air, beachside restaurants for a meal and perhaps a bit of dancing. You may enjoy some of the other attractions within driving distance, such as Ocean World, where you can swim with dolphins and snorkel inside an enormous saltwater coral aquarium. If hiking is more your style, catch a bus to Rio Damajagua. For the equivalent of a few U.S. dollars, you will receive a life jacket and a helmet. Two guides will assist you on a 30 minute to one hour hike to the 27 Charcos, or 27 Waterfalls, where you will have the thrill of your life jumping, sliding, and splashing through a naturally occurring water park. Unique among Dominican Republic beaches, Cayo Levantado is a small island located off the beaten path. A little more than four miles (seven kilometers) from the coast of Samaná, visitors can charter a boat to reach the island. There they will enjoy three white sand beaches and hiking in the lushly forested interior – a vision of having an island paradise all to one’s self. Visitors should be mindful that few facilities are located here. Travelers should bring with them all supplies they may need for the day’s activities. On whichever Dominican Republic beaches you decide to stay, the country’s coastline is a vacationer’s playground, year round. 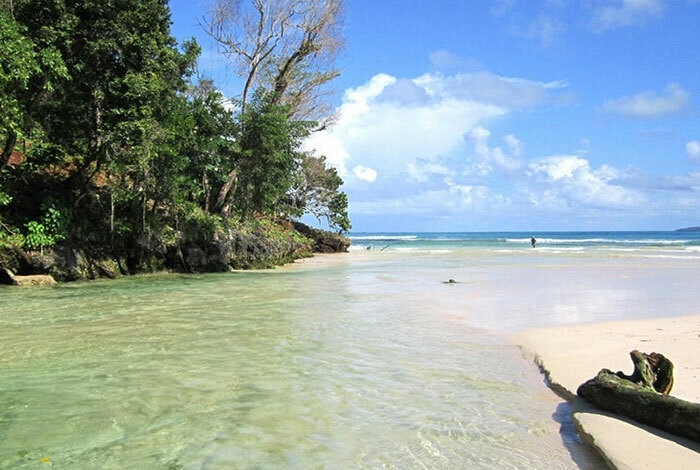 Do you know of a Dominican beach destination that our list omitted? Share your story below!